PLANO, Texas, April 2, 2019 /PRNewswire/ -- It's been 17 years since Pizza Hut originally launched the P'ZONE® in 2002 – and judging by the fanfare of its return – it's safe to say everybody loves a comeback! In honor of the P'ZONE®'s triumphant return, Pizza Hut will continue to feed fans' excitement this tournament by giving away a FREE Pepperoni P'ZONE® to fans nationwide if a team overcomes a 17-point deficit to win during the Final Four or Championship games in this year's NCAA March Madness Division I men's basketball tournament. 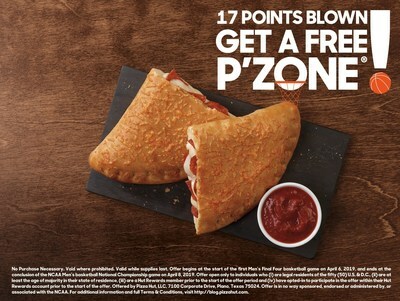 In other words, if 17 points are blown – YOU, can get a P'ZONE®! 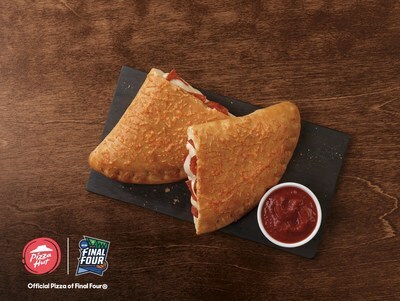 To celebrate the P’ZONE®’s triumphant return after its initial menu debut 17 years ago, Pizza Hut, the Official Pizza Sponsor of March Madness NCAA, will give fans a chance to win a FREE Pepperoni P’ZONE® if a team in the Final Four or Championship games come back from a 17-point deficit! "We loved the enthusiasm and passion our fans displayed when we announced the return of the P'ZONE®," said Marianne Radley, chief brand officer, Pizza Hut. "We wanted to find a way to bring the excitement of what's happening on the court to fans at home, and there's no better way to reward our P'ZONE® lovers than with the potential to win a free one during the pinnacle of March Madness!" March Madness is an emotional rollercoaster for fans and Pizza Hut is raising the stakes for P'ZONE® enthusiasts across America. To be eligible to win a free P'ZONE®, you must be a new or existing member of Hut Rewards who has opted-in to participate in the promotion within your Hut Rewards account before the tip-off of the first Final Four game. Free P'ZONE®s can be redeemed online on April 17, 2019. The promotion applies to Pepperoni P'ZONE®s only. Sealed inside a toasted parmesan pizza crust, the beloved P'ZONE® is filled with savory pizza toppings and melted cheese, baked calzone style and served with marinara dipping sauce. A perfect addition to any March Madness watch party, customers can choose from Pepperoni, Meaty and Supremo recipes. This announcement caps off Pizza Hut's third year as the Official Pizza of NCAA March Madness. Pizza Hut's March Madness program launched with the announcement of the return of the fan-favorite P'ZONE® and included new TV commercials featuring some of the most famous March Madness reaction memes from recent years. The P'ZONE® is available on its own or you can get the Pepperoni P'ZONE® as part of the $5 Lineup at Pizza Hut locations across the country for delivery, carryout or dine-in. To stay up to date with Pizza Hut and all things March Madness, follow along on Twitter, Instagram and Facebook. For more details visit Blog.PizzaHut.com or head to PizzaHut.com to order now. No Purchase Necessary. Void where prohibited. Valid while supplies last. Offer begins at the start of the first Men's Final Four basketball game on April 6, 2019, and ends at the conclusion of the NCAA Men's basketball National Championship game on April 8, 2019. Offer open only to individuals who (i) are legal residents of the fifty (50) U.S. & D.C., (ii) are at least the age of majority in their state of residence, (iii) are a Hut Rewards member prior to the start of the offer period and (iv) have opted-in to participate in the offer within their Hut Rewards account prior to the start of the offer. Offered by Pizza Hut, LLC, 7100 Corporate Drive, Plano, Texas 75024. Offer is in no way sponsored, endorsed or administered by, or associated with the NCAA. For additional information and full Terms & Conditions, visit here.